What we would love to see is when we access a contact, or lead, within CRM, the ability to see any or all of the communications, comments, likes, follows, etc.. that they have had on social channels. And likewise have the ability to comment, communicate, like, or follow a post we see in CRM. This would allow us to better reach new customers and vendors, to broadcast our brand, and also allow us to always “touch” our current customers and vendors and keep them up to date with our company. @jonporreca you’re spot on! Zoho CRM for Twitter can now address these scenarios for salespeople! Zoho CRM for Twitter helps you know your customers even better by connecting with them right from within Zoho CRM. If your customers are on Twitter, you can find out their likes, dislikes, their current interests and what they’re talking about. These insights might just give you a substance to start an effective conversation with them! Say, your customer is excited about a Soccer match between Real Madrid and Barcelona. If you’re equally a Soccer fanatic, wouldn’t that be a great topic to strike the right chords with your customer? That’s simple right! OK, here’s another way you could use Zoho CRM for Twitter. Say, your customer is holidaying in Paris or traveling on business. There is every chance that he might miss your call, or dismiss it as unimportant. So, how do you know when is the best time to contact your customer? By looking at their tweets, you can get an inside scope of when they’re on vacation, traveling on business, in a meeting or at their desk. Of course, the chances of closing a deal are more while they are at their desk. What else can you do with Zoho CRM for Twitter? You can tweet, reply to tweets, retweet or favorite recent tweets of your prospects. Visit our Online Help to get started with the settings. So go ahead, listen, engage and connect with your customers without stepping out of Zoho CRM. 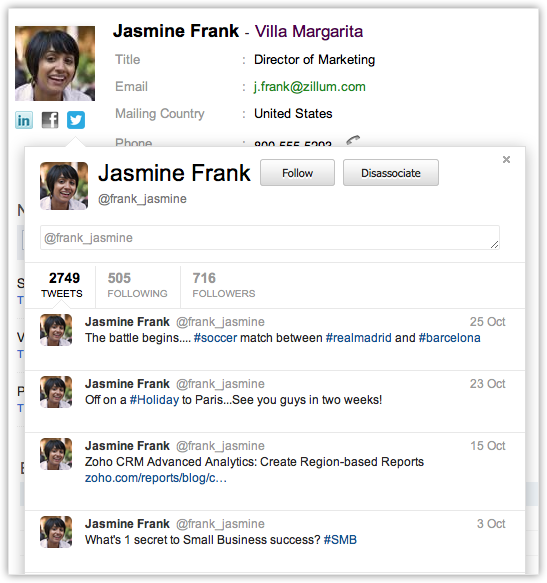 Nice CRM tool, i didnÂ´t know about the social media integration ! Gaeta, SÃ©rgio – Brazilian Consultant from Software CRM da SBG. Hello Ryan,Zoho CRM has integrations with social media sites such as LinkedIn and Facebook. This is a step forward, but it should be much more integrated and automatic. When I look at a contact, I shouldnâ€™t have to click on the Twitter or Facebook icon to see recent activity. It should just be there in the sidebar. Check out rapportive for gmail: rapportive.com. Thatâ€™s what I want in the right sidebar when I look at a contact in Zoho CRM. Screen shots do not match fields in Zoho. Whatâ€™s missing is General Permissions and the choices associated with it.